Is DealDash Really Fair and Honest? DealDash claims to be fair and honest, and an alternative to all of those penny auctions sites that have become so popular in recent years. It even goes so far as to say that it is easy to win the auctions. But should you get involved with this site, or will you just end up losing money, and getting products that you don’t really want? Since it claims to be a viable alternative to penny auctions, it’s important to explain what a penny auction site is. This is where you don’t actually place bids on an item like you would on eBay. You are able to place bids on an item but it costs you to bid. If you are the last bidder when the time runs out you get the item at whatever price it ends up at. That means that potentially you could get the item for a few cents if you only place bid at the right time. Here’s how DealDash claims it works: all of the auctions start off at zero dollars. Every time someone bids the price of the product goes up by one penny. It costs $.60 to place a bid, and every time someone bids the timer gets reset. If your bid is the one remaining when the timer goes out, you win the right to buy the product at the price it is currently at. So the theory here is if you bid strategically, you could end up with a product for a drastically low price. The flipside is if you really want something you could end up racking up plenty of fees by bidding so much. Penny auctions thrive on hype. The thought of getting namebrand products, expensive electronics, and anything and everything you can think of for such low prices is enough to drive people into a frenzy of bidding. Signing up with DealDash is free, but in order to bid you will need to buy bids at $.60 each. After that it’s totally up to you how much you spend, because you choose how many times you bid on a certain product or how may different products you bid on. You really have to resolve yourself to spending a lot of time on the site in order to learn how to bid properly and get good deals. Most people think that they can just get lucky by stumbling on the right product at the right time, and placing a bid and getting a product super cheap for just a 60 cent fee. However, there is a bit of savviness that is required in order to have a higher chance of getting the product you want without paying more for it then you should. The site even offers a page filled with tips and tactics that you can outmaneuver other bidders. DealDash is kind of like gambling because nobody likes to talk about their losses, they only want to tell you about their wins. It might be exhilarating to get a product at a low price, but how many bids did it take to get the item, and does the overall transaction work out in your favor? The big flaw to every single Penny auctions scheme is all the times you bid on items and don’t actually get the item. This represents flushing your money down the drain $.60 at a time. Essentially that is the main reason to avoid these sort of sites, because there is no joy in spending money and receiving nothing in return. The vast majority of people end up burning through their bids, not getting the product they wanted, or getting it at a price that makes it so they could have just bought it outright directly from the manufacturer. Let’s say you buy 100 bids for $60. You find some products that you’re interested in, and start bidding on them. You place five bids on five different products, and so you’ve already spent three dollars. Of course, someone comes behind you and also bids on the items, rendering your bid useless. So you give it some time and let some other bids roll in and then you think that you have a chance at getting them, so you place five more bids on the five products. You’re now down six dollars and you’re hoping that no one else places bids so that you can get the items that you want. But that rarely happens, and someone will come by and place a bid, forcing you to make a decision whether to choose a new product, or keep an eye on the ones that you were originally interested in. It all boils down to just a big hassle, and stressing every time somebody bids on top of yours. The only saving grace for DealDash is they have a By It Now option which returns your bids to you if you use it, but then you’re not really using the auction feature you’re just using the site to shop from. Although DealDash emphatically states that they are honest and fair, it doesn’t take away from the fact that their business model relies on people bidding on products and not receiving products. We recommend against signing up and using penny auctions because frankly they just don’t make any sense. It’s almost like a carnival game at the amusement park. You know it’s probably rigged against you, but you just can’t help going for that big pink bunny rabbit. Save your money and just buy what you want at reasonable prices from online retailers. This way you’ll always get what you want and won’t waste any money doing so. What do you think? Does DealDash work or not? Does the CAA Roadside Assistance Really Work? These penny auctions are really tempting every time I see their ads and there have been few occasions when I almost tried them. I guess some people could really make money in this thing, but I think they’re the minorities. Also, I think the major winner is the penny auction site itself and most of us are losers for even trying. Maybe I’m being too critical about it, but that’s probably how it really is. It is like you say, you must spend alot of time, money and effort. I did try one of these penny auction sites a couple years ago and was so frustrated and disappointed because there were people who (I think) know the system well (or its rigged by the co.?). Either way they have the advantage. I spent a whole afternoon, about $100 and ended up with not one item. It was very disappointing and a waste of time to me. I thought I try this and honestly, I feel its not worth the time and money. You buy a pack to put bids on items seems fair at first. After placing 200 bids on an item and using the entire pack (that is worth worth $72 dollars) on two items. NOTHING, that right nothing to show what I put my money into. At least with Ebay you only pay out if you win, here you lose all your money so its really a gambling site not an auction. I feel that Deal Dash should me more forth coming with their business and admit what it is not an auction, I would have never tried tried this if that was the case. This was a big waste of my time and money. It’s the same old comment that you hear time and time again, LAS VEGAS WASN’T BUILT ON WINNER’S! These penny sites are in bussiness to make money not give it away. So, yes it is just like playing the penny slots in Vegas, you see the jackpot on the top of the slot machine and you have to have it. Most people don’t know but, if a slot machine starts winning, it is removed from the casino floor because it is not working properly! I only know this because I was born in Las Vegas and have worked on the Strip my whole life. So, GOOD LUCK!!! They aren’t getting my $$$! Deal dash is a rip off. First time on site, they charged my card 70.00 and I never used it. Make sure to read the reviews first before you go on their site. Thanks for the review. I make it a point to find out about a site before I get in to it and this was very helpful. Contact me: Re: Deal Dash. alliedrecovery@live.com. I’d like to know more about your experience. That makes perfect sense! If they are passing out free bids than they are paying someone to fake bid. Smells like a scam! I have tried this and it seems fishy. I bid for hours on an item battling one or two other bidders. After enough money wasted I stop. Then wham the next bid wins. Very odd two bidders pull out at the same time and the very next bid is the winner. Trust me I am real person I have won couple of things for very cheap price from dealdash.com people just have money and they are not experienced enough to bid their bids. It is legit website and I can prove it. Classic Decepticon tactic, blaming the Autobots..
Having a look at the website I have to say that it reads a scam or something extremely dubious. I never really trusted auction sites because you never seem you can win for popular items. But then again that’s pretty much the whole point of having an auction in the first place. But you can find nice things that people give away that are too ignorant to know what they sold was a priceless heirloom. Something you could sell for a high price but because they didn’t know or didn’t care. You can benefit from that. However, Kirio does make a good point so I might consider penny auctions in the future. This drives up the bid volume, at no expense to DealDash, because the bidders are their automated users, NOT paying the $0.60/bid. How can you compete with that? In short, this is a fraud. I think that if indeed they use false user names to drive up bid prices then they should be brought up on criminal charges, the thought makes me sick. I have watched those sick adds for about a year. I am so glad I have Google Fiber, so I can fast forward them. Every time I don’t have time saved up on my tv, I have to change the channel. It makes me smoking mad. I always see some poor old man or woman thinking they are going to get a cool toy for a grandchild…only to be ripped off. Sick, sick sick !!!! What has happen to mankind ? Freeze your tv sometimes and read the fine print on all these adds. We are rolling down hill like a snowball headed for hell. I can’t believe the government slows this sort of thing….oh ya, they are worse. What was I thinking ? Sorry for the typo. I mean alows this sort of thing. I don’t normally post comments on forums, but that deal dash thing burns me up ! I have been using the site for 3 days and I saw a $50 walmart card win at $89 and a $10 CVS card win for $31….but I am also a mathematics professor and I believe I know one possible explanation for these occurrences. I believe it could several real users (so not robot users) that work in tandem to do this and here is how I believe the scam works: the participants pick something like a walmart card to bid on since the retail value is accurate….meaning the card has the right dollar value as the price….and if you regularly shop at walmart like I do for groceries lets say, then a $50 walmart card is just $50 you were going to spend anyway….Also note that if you lose an auction regardless of the number of bids you use you are given the option to buy the item you lost in the auction at the list price AND get back all the bids you used in the auction…..So here is the motive….you gain free bids based on the time you spend as the highest bidder…So you will see a regular pattern in bidding develop where each member of the cheating group takes regular turns allowing each member of the group to spend the full 10 seconds as highest bidder before moving to the next bidder….the bid price only raises one penny for each bid and the free bid counter for time as highest bidder is often set for 3x or even 4x speed…Also the amount of free bids you can earn as highest bidder is a function of how many prior bids you have made….so the more bids you make the faster you can earn free bids….so the catch is to continue sharing time as highest bidder driving the bid price up a penny at a time….but to maximize the effect they continue this bidding method until the bid price actually well exceeds the actual sales price to get as much time as possible as highest bidder for each member in the group….sometimes driving the bid price to even 3 times the sales price with the intent that all of these members participating in the scam have been able to earn huge amounts of free bids each and then they all lose the auction and get all the bids spent in the auction back and they just all purchase the walmart gift card at price and take away all their free bids….BUT HERE”S THE REAL CATCH….someone has to win the auction for it to stop right….So you may ask how and why would anyone even try to win an auction win the winner both gets stuck losing all of their bids used in this very long auction and is stuck having to pay the winning bid price which is way more than the actual price of the gift card?? How does that even make sense right….WELL HERE”S THE REAL BEAUTY behind the scam….if you only place one early bid you then have the option to wait until the very end of the auction to place the final winning bid (so the winner in the scam is a designated bidder who only expires maybe one or two early bids and then after hours of bidding comes in to make the final winning bid…so the winner of tha auction only uses a few bids to win)….but you may ask the question: what about the over-inflated bid price the winner is stuck with right?….well everytime you win you are given the option of either paying the winning bid price for the item that was being bid on OR you can opt to not pay the winning bid price for the item and take a bid pack of free bids instead….So now the true nature of the scam is revealed…..all the losers working together walk away with a ton of free bids and they buy a gift card for walmart that they were going to eventually spend anyway at walmart with or without he gift card and one designated member expires a very small number of bids to be the designated winner who then opts to not pay the over inflated bid price but instead picks up a modest free bid pack instead….I imagine the members of such a cheating bid group probably take turns as being either the losing bidders raking up the free bids and one takes their turn as the winning bidder as I described. Finally the reason I think my explanation is more probable than the explanation that the bidders are planted bidder bots by dealdash is that when I was involved in the early bidding rounds of one of these that went well beyond the listed price I noticed that the bidders were all systematically taking turns as highest bidder each one taking the full 10 seconds each…but when either myself or some other bidder entered the bid, one or two of the cheating members would immediately break the pattern to start “jumping” my bids…I.e. only allowing me one or two seconds as highest bidder…I was also planning on buying the card too so I was out to simply raise my free bid count just like them…only difference was I bailed on the auction as soon as the sum total of my bids plus the current bid price reached the same total as he sales price…so I was using a similar strategy but mine was an honest strategy in which I either win at a point where the costs of my auction bids plus the bid price is lower than the listed giftcard price or I bail and pay the list price for the giftcard and get all my auction bids back ..AND gain all the free bids I earned as highest bidder…So I figured I had nothing to lose…..Interestingly though when I challenged the members of the cheating group that were “jumping” my bids by then jumping their bids I noticed a somewhat extended jumping war would go on between myself and one or two members of the group…but I refused to back down and I would go back and forth vigorously for up to a minute at a time jacking the bid price up rapidly while at the same time “hijacking” the auction from the other members of the cheating group …so eventually the jumping challengers backed off and I agreed to take a place in their rotation where I patiently waited my turn to take the highest bidder spot and they let me have my full 10 seconds as highest bidder each time my turn came around…At first I thought they were all just doing the same thing as me and they were also going to bail on the auction long before the bid price came close to the actual sales price…but instead I bailed early when the price of my bids (which I was calculating as 10 cents a bid) plus the bid price reached the sales price….but then they all continued taking turns bidding for hours and hours after I had bailed until the bid price had already gone way over the sales price….So these were not bidding robots…there is no way bidding robots would have reacted to my presence in the way they did…this was a group of real people that figured out the scam I described above and all the losers probably were able to each generate hundreds of free bids each until the designated winner finally came in and made the winning bid and collected his or her modest free bid pack for winning while only expending two or three actual bids in the entire auction. What do you all think? I think I uncovered their scam…..I can not say whether or not dealdash is scamming us in other ways though….but in this particular situation where you see a group of bidders systematically taking turns as highest bidder and each highest bidder is granted the full 10 seconds ..And the bid price is driven up way past the actual price of the item being bid on (which is usually a walmart card or a gas card or something that people regularly spend money on anyway)…I believe you are witnessing the group bidding scam I described. The waiting till the end of the 10 seconds is not because it is a scam. It is called BidBuddy. It allows you to place bids without having to be there. You tell DealDash how many bids you are willing to place, and it will automatically place the bids. If multiple people have a BidBuddy going, then they take turns bidding. Meanwhile others users not using BidBuddy can wait for the other people’s BidBuddy’s to run out. The Better Business Bureau gives DealDash an A+ and it has a rating of 4.91/5 on BBB.com. I’m a DealDash user, and I’ve won a flatscreen TV by placing 2 bids. I’m a strategic bidder. Please stop saying it’s fake without proof guys. Wait, why did I say that, say it’s fake so less users come on so I can win more. Hmmm. It’s always a “Flat screen TV” when some mysterious supporter shows up to defend. Move along. Charlie is definitely NOT a social media manager hired to defend DealDash. The last “penny” auction site had company paid bidders driving the prices sky high. I assume this is happening here are well. This is most likely the same company different name. Yes, it happens because of the message indicator “Checking…” As soon this message appears in many bidders’ screens, a group of bidders immediately jump into it and starts this irregular bidding. It is dealdash knowingly created scenario, which is again another unfair practice to jack up the auction and price. Dealdash programs are made to stimulate and extend the auction by this message. You have written what I consider a good description of how deal dash works. I joined last week and have spent many hours and many $$$. I won a few items, bought a couple of items, and spent a great deal of time online. I probably “broke even” meaning I paid full price for the items by the time I take into account the money I paid for bids and the money I paid for items. My final thoughts are that I spent time in a “casino”. It’s like playing slots. I did buy some nice items. BUT I’m out. deal dash is not for me. It is something that could easily get out of control much like gambling. AND they are making money hand over fist. Just about to sign up and found this site. Thanks for the feed back. Not joining the site. Please read my reply to Christian’s post just a post or two above yours….I think I have figured out how and why that is happening, Please read the explanation for this that I came up with and all the reasons I gave for why I think I am right and let me know your feedback b/c I” think I may have uncovered a very well thought out group bidding scam that is being perpetrated by actual people not bidding robots… And if I am right about this, it is definitely a very clever massive bidding scam and someone needs to notify dealdash about it because it severely hinders (i.e. makes it impossible) everyone’s chances of winning an auction where this scam is being employed. Well your theory is wrong because you actually lose your bids if you do not win, and the amount of free bids you earn are not enough to make up for the losses. I tried it out today just to see for myself and yes, their are groups that work together however you do not get your bids back if you lose unless you choose to purchase the product at the buy it now price which is generally more than the product is even worth at walmart for instance. I’m glad I checked out all these stories about DealDash before I started to waste my time and money on these type of scams out there. Thank You. The only way you “win” on these penny auction sites is to be a newbie. They practically GIVE you the cheap $10 giftcard and a few other nothing prizes. It’s just enough to get you hooked. Then you think, “wow, this is so easy”. That’s when they have you. You pour endless hours and money into the site with nothing to show for it. If it’s something you really want, just save yourself the aggravation and go buy it. you can definitely take advantage of dealdash. for one the bids are always on sale. they average about 15 cents each. now here’s how you win. you need to see what type of auction you are. some you pay the final auction price, some you pay half, and some you don’t pay for. i realize this makes no sense but if you go on the site you will understand. now say a month from now you have a birthday party to go to. you’re going to give 100 toys are us gift card as a present. you can go on deal dash and try to win one. you have to figure what your total cost is per bid and what final cost is. so if you buy bids for 15 cents every hundred would cost you 15.00. so 500 costs 90.00. if its a free auction you could bid all those and still save 10 bucks. not great i know. but there is a chance you could get it for almost nothing. why it works is this, if you lose the auction and purchase the card for 10000, which you were going to do anyway, you get all the bids you used back for free.if you bid on nothing but gift cards you were going to use anyway as long as you win one time for less you can easily come out ahead or even. win 2 or 3 and it’s all worth it. if you want advice or me to explain more respond and we can figure it out how to get in touch. Are you that company that is paid to put positive stuff on these sites. I’ve run into you guys before on other information sites. You don’t say the whole truth but you keep pushing the lie and tying to bring people back to the site with renewed hope. If you have to put any money down ( your own money). Then it’s just not a free anything. If that doesn’t scream scam I don’t know what would. Wow, thank you all for the great information. I keep seeing the commercial for dealdash.com and was thinking of giving it a try but something just didn’t seem right with me. So I decided to just type in the search engine dealdash and this site came up. I belive what you all had to say and I will NOT be buying bids. If I want or need something I will wait for it to go on sale or if need be will just pay retail price for it. Seems like I will be making out a whole lot better then paying $100.00 + extra for an item. Thank you for posting and sharing your experience or advice on this. It was much appreciated. I used Dealdash for the first time yesterday. I won 4 items. $10.00 Dunkin Donuts gift card for $.02 and 3 bids. $10.00 Burger king Gift card for $.01 and 1 bid. $10.00 Walmart gift card for $.03 and 2 bids. A Magisso cake server (retail $35.00) for $.01 and 1 bid. I bought bids at $.11 packages on sale. So all that being said, if I receive these items then they made a believer out of me and I will work on a strategy for higher priced items. This weekend, I am seeing items go for outrageous prices. The site is going crazy..probably the Black Friday fever pitch…but I’ll be patient and wait for the action to die down before bidding anymore. Maybe I caught it just right? Won all the items within 30 mins. Like anything else, be smart and I think you can do well there. We’ll see. Well Dan, you just proved to me that Deal Dash is a HUGE SCAM! Two days ago I won the exact same $10 gift cards from the same Retailers. Since then I have not won a damn thing and the bidding definitely is suspicious. I am wondering if you ever got your gift cards? It is also odd that since that very first day I have not seen any $10 cards, only ones much higher in value. I spent 30 for bids because i thought i could get something expensive for free..(but the auction hadnt started yet) so there i was stuck with 240 or so bids.. so i tried a 10 dollar gift card.. I won for a few cents.. so i got 3 more gift cards since, so i’m up. i still have over 200 bids left and will wait for more late night 10 dollar gift cards. I think that you cannot see items after you win them. because no more gift cards showed up.. till i checked back months later. right now i’m up 40 in gift cards (10 dollars each) at a cost of a few cents out of the ~ 30 dollars worth of bids i bought. I haven’t bid on anything more than that cus winning seems remote. It almost seems like only newbs can see some of these auctions cus there is no competiion. but remember too they let you “doover” your first auction. money back guarentee. so they “Let” you win a 10 dollar gift card.. to use up that do over.. which could have very well been hundreds of dollars on a 14,000 dollar item. I can also see how working in teams can let you win more often.. you basically stay out of bids till it’s down to 3 people. if you wait for two and those two are working together it wil end as soon as there are 2 people. then you jump in when it gets down to 3 people. if your two or three people working together you simply just stay in it till it’s only your team bidding then just stop bidding. I dont trust anything like this on TV. TV ads is full of lying and evil. I go to store only. For bids, use EBAY but with caution, thats all. “Deal dash the fair and honest bidding site.” B to the S. No fair no honest period. If this were even half true they would put in the TV ad that the iPads, computers, and cameras they sold for $30 made them more than a thousand dollars and they would be honest and tell everyone watching the commercial that you will have to spend a few hundred dollars on bids that you buy in order to win that item. Don’t sit here and tell me someone just bought an iPad for $10 because that tells me I should be able to go to your website and spend no more than $10 on that iPad but if I’m spending $300 on bids then I didn’t really get an iPad for $10 I got it for $310! It’s all part of their deception game they lie to everyone but oh I forget if they told the truth and said in the commercials you’ll spend $310 on that iPad not the $10 we lied to you about people wouldn’t go to their site and waste money on bids and they would be broke and they can’t have that because it doesn’t fit their agenda to help fill their pockets with money. That’s life for you. My daughter and I have participated in Deal Dash. The Pros are: It’s fun and we never go overboard. Do not waste money you don’t have. We have won several good items and were able to sell them at a profit. Cons: Can get carried away. Hard to sell items. Packages never arrived even though both Deal Dash and Fed Ex claim they left them on front porch. We are generally home. DD never return calls. It’s always a message that they’re looking into it. Also claim they had a “glitch” in their computer and we would get our money back in a certain amount of time. It never comes. When they offer FREE bids, it’s not so. Always find money taken out of account. So no I don’t believe they’re really honest. As usual, it is Buyer Beware. The real question is, why are companies like this allowed to exist at all? Why are they allowed to advertise on television? I guess we don’t have ENOUGH government regulations! Its basically set up like a lottery,slot machine or raffle. Many people buying a chance to get something for nothing. It’s a 1000 people bidding 1 dollar to win 100 dollars. 999 people will have lost a dollar but what will be advertised is the 1 winner ” I won 100 dollars for ONLY 1 DOLLAR!”. If the only expenses were the cost incurred for the winning bid then these tales of winning items at bargain prices would be relevant. Unfortunately nobody is cost factoring in all their losing bids and the odds of winning. I believe that’s why the lottery lines get so long, everyone wants to feel like a winner no matter how much it really costs in the long run. The math isn’t as complicated as the workings of the human mind and ability to be delusional. Now combine that with poor math skills and greed then someone gets the goldmine and everyone else gets the shaft. I’m having fun with DealDash but see the pros and cons for sure.. If you don’t work out a strategy, you are definitely going to lose money. If you do work out a strategy, but are not able to exercise self-control, you will similarly lose money. I’ve learned a lot since I started using it earlier this week, but what I haven’t seen anywhere yet that I think is really important is how GROSSLY inflated the so-called “retail” prices for a lot of items are. Sure, they can’t get away with claiming a $50 gift card would cost $100 — but it seems to me that for almost everything else, the retail price listed is probably almost double what you could actually find the item online for. Also, I have found myself falling into the trap of bidding on things I would not give a second glance in, say, a catalog because the process is so freakin addictive. The takeaway should be: BE CAREFUL and read up on strategy online. Also, there is a list of people who are essentially pros at this somewhere. I looked up this guy “RichnBorrd” and found out he’s like the top DealDash winner ever, and if I see his name in an auction I won’t bid on it again, because he apparently has endless bids and just likes to gamble. I’ve lost countless auctions thus far, but I did win for 1 cent each some $10 gift cards — by placing bid buddies on them to bid at the start, and I guess no one else bid. I also won a higher value item, a bracelet, by keeping close watch on the item, bidding once before $5 and then setting up BidBuddy to kick in when I noticed it was down to the same two buyers. I think that makes me an a-hole in DealDash land but I don’t care. Have you not heard the term. If it sounds to good to be true. Yes you may win a computer for 8.45 cents there are 400 people who paid 8.44 for that computer, I am not a Mensa Member but add it up, deal dash.com good for you as B.T. Barnum said there is one of us born every second. After reading all the comments I believe it is rigged. I won two items right away and never won again. I see where the item sold before and the amounts and think it is worth a try. No matter what I bid on there are always bidders pushing the price up higher than what the item sold for in the past. I never win at $1, $4 or $10 on any items. I put 500 bids on an item and lost them. The first item I won it was with the first bid withing the 10 seconds for a $10 Walmart card. I watch auctions on the $10 card afterwards going as high as $50. REALLY! I have wasted my money since the $10 card and a handbag. Once my bids are gone I am done. Just wanted to add this to let you know why I don’t believe this is real. I bid on a $50 Walmart card and after 200 bids I bought it. You get your bids back so I didn’t lose anything. A week later that same auction is still going. There are 155 bidders and it is up to $600.75. Do the math!!!!! Now why would you risk winning it now only to get the $50 card or equal in bids. The other 154 can buy the card back and get their bids back. It seems quite unreal. Biddestroyer was bidding on a regular basis a week ago when I cashed in and is still showing bids on it today. Why not just flush your money down the toilet. I used deal dash for three days and seemed to have success……so far. Although you have to use strategy for bidding, luck won’t work! I spent $80 dollars for 800 bids (200 free and then you earn bonus ones here and there). My frist attempt was at something i didn’t even care for so i just tested it out and wasted 50 bids. My next attempts were at $10 gift cards and one 4 of them on first bid as no one else bid on these, to: Dunkin Doughnuts, Wal-mart, Burger Kind and Pizza Hut. Which I think is ploy to get you hooked because on the third day i seem to be unable to find these gift cards to bid on. I did also end up winning a $675 Knive set from Kamikoto, (I love cooking and own other Japanese pricey knives so it was an auction for me). After placing my first bid I held off for 4 hours (Once an auction goes above $5, no new bidders), after fours hours the price was around $20, i set the bid buddy to 600 bids, left the computer and 2 hours later got notification that i won at $35, very pleased and still had some bids left. My take away is you have to use strategy, time-off day, really want a product and go all in, check out average prices it sold in the past and make sure the # of total bidders is low after the $5 mark, last is a little luck to out-last the other bidders that committed to a lot of bids also. I know have 300ish bids left and will wait to rack up free daily bonus bids till i bid again. None of the review sites mention the extremely over-inflated Buy It Now prices? DelDash claims they use manufactures’ suggested retail prices (MSRP), but there are some really questionable prices. The extremes I have seen are anything from Barrel Shack, Ava cooking pans, ($990!!!!) and Kamokoto knives, which I researched before bidding on them. I later learned that all of the sites I checked were fakes, set up by the manufacturer! eBay and Amazon both sell offer them at or near the inflated prices. I checked the reviews on Amazon. I then learned that many (all?) of them are also fake. The only thing I can add is Buyer Beware! Their support team is decent. Be very aware of how much each bid costs! They are a “penny bid auction” but as others said, the ACTUAL cost of each bid must include what you bought the bids for. I have yet to see 60¢ bids. I have seen bids range from 12-15¢ each. Whichever size pack you buy, bids are all the same price. There is no discount for the larger packs. Good luck, but don’t get emotionally attached to any item! Similar is their Bolvaint Paris line, tried googling their ‘Paris’ location and yeah they are not one of the boutiques listed. It is very clever though, i will give it to them and people are happy when they win but when they try to resale on ebay/amazon they learn quick that the products don’t sell anywhere near the dealdash sticker price. DealDash is a lot of fun… but it is also NOT fair and honest. Their latest ploy is, when you join, you have to spend $70 up front on a 600-bid pack. Then they put up auctions only you can see … $10 gift cards for Walmart, Burger King, Pizza Hut, Dunkin Donuts… that you easily win, thus returning part of your initial investment. This way everyone gets to quickly experience the thrill of winning. You are misled into thinking, hey, it’s easy to win … and you’re hooked. They used to offer lots of gift cards as prizes, but now mostly only offer merchandise from a few companies they have contracts with (Barrel Shack being a big one). The value of the items is very over-inflated. So … lots of fun, yes. Also … look out for bid-bots used to drive up prices on some expensive items. I’m not entirely convinced that these are “businesses” they have contracts with. I think they were created by Deal Dash, then elaborate websites were made for these fake businesses just in case someone wants to check & see if the retail price is really that high. I think they just hire people from China and other countries to make items they request, such as pans, silverware, ‘designer’ bags from Paris, bicycles, etc. I’m not saying some of these items aren’t well made, but it’s still very deceptive. I’m not sure about some of the other accusations from other people saying there are robo-bids, but I wouldn’t be surprised. It’s a fun site, but just be aware that the items you win are not from actual well established companies. They should just be honest and admit it. also for prices that go above MSRP. realize that some auctions regardless of the winning bid are free auctions.. meaning the only cost to anyone involved ist he price of the bids.. the actual number it sold for is ignored.. it is a free auction. this might explain why people sya they see 600 dollar bids for a 25 dollar gift card.. the winner does not have to pay that 600.. only has to pay for the bids htey made.. wich could have been as low as 2 bids. I learned the hard way. Avoid Deal Dash! Save your $$. and Time. It is not a bargain!! Like Dan above. the first day or two that I used the site, I won 6 various $10.00 gift cards for .02 and .03 and .04. Life was good. those first few days they must be newbie auctions for people who recently joined because there were no competitors. After the honeymoon, you get sucked in. You start thinking, ok I will buy another 300 bids for .15 cents a bid and you win nothing. So you buy more bids. and win nothing. then you say, i am due for this other person to stop bidding and you buy more and more and more. And before you know it, you spent $200-250 on bids for something that costs $125. BTW-there retail prices are 5-10x the actual value!! you are better off shopping at Amazon Prime and get exactly what you want. Don’t be like me and blow a lot of $$ on stuff that has questionable quality from companies like Bolvaint and Adamant that you have never heard of! again the there retail price is a farce. Also, the shipping on some products takes weeks or even months. However some junk you get within 7-10 days. the kicker is that is really really time-consuming! you spend too much time on the site and not enough time doing important life things. It is true gambling with retired people blowing there $$. I won a few nice items but realized quickly that I was treating it like gambling. You see the same names on there over and over, trying to get stuff cheap… then miraculously, all the same items keep showing up for resale on eBay. I believe that Deal Dash tries hard to keep people from buying items to resell but it is an after-the-fact kind of enforcement. The people who do it for a living are ruthless and take a lot of fun out of the experience. By the way, the number of items is limited and you keep seeing the same merchandise over and over again. Ask youself, “Do I even want to buy this thing>” and you might find that it’s more about the winning than it is true shopping. Those names you see over and over are often resale companies that can afford to be “ruthless”. It is not just one person doing the bidding. If you were to see their earliest auctions you would see a patter of overbidding. This is done to establish their name and reputation. In time when individual bidders start to remember the name, they will bail out of an auction where that name enters the bidding. It is sometimes called “power bidding” or “bully bidding” and is one of the things that has put countless penny-auctions sites out of business. It is like many forms of business in that you have to have money to make money and in the beginning you suffer losses similar to “lost-leader” specials that establish your mark. You will also notice that these “bidders” go after “bid-package” auctions and obtain them at at easily 80-90% less than new bidders pay to get started. If you want to see an auction site that is in the process of being taken over by power/bully bidders then check out HappyBidDay. com Do a little research on that site (you CAN join without buying bids) and you will see what I am talking about. So right now a $10 Subway card is over $68.00-makes you wonder who the devil is bidding. Rip off. That just means that 6,900 penny increment bids have been places. Those bids commonly sell quite low in bid-packs auctioned on the site. Those are total bids of ALL bidders. Often power bidders with reputations will will with a tiny fraction of those bids because once they start bidding everyone else stops. There is a lot of strategy involved. DealDash is the ultimate ‘dangle the carrot then bait and drain their wallet’ site. It reminds me of the old traveling carny games of chance where they keep edging you on to bid more. Just watch the bidding turn-over every time just one-second before the item is to be won. It’s so obvious watch and see for yourself. My suspicion is all the auctions are ‘bot’ controlled to maximize the bidding profits fo as long as possible, and in the end when (if?) you do win you end up paying more for the item that what you could have obtained it for on legitimate sites like Amazon, Etsy and eBay. Stay away from DealDash people. They are clearly engaging in unethical business practices. Period. Thanks for your message and I will be glad to help. From what you have told me, it sounds like the web browser was not updating immediately. 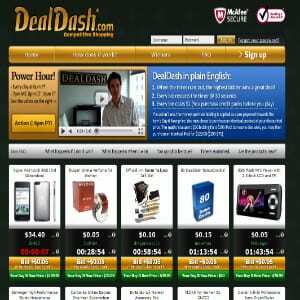 DealDash is one of the most reputable and trusted auction sites in the industry and all auctions are played with real bidders just like you trying to win a great deal. I’m sorry if this has caused you to think otherwise. As the site uses Internet as a medium, there is always the possibilities for lags, delays, network interruptions, etc. When the timer shows the ”checking” status, it indicates either a slow connection, or the system was checking for any booked BidBuddies from other members that it must activate and keep the auction running. I do know that no one has had any extra time or advantage to try and outbid you. In the case that you see the auction timer hit zero and you are not immediately congratulated with the fireworks animation, it may be the case that there’s a delay in automatically refreshing the website. I’d recommend quickly refreshing your browser to see if the auction has ended or not: either the auction is still ongoing and you still have a chance to participate in the auction, or you’ve actually won the auction. One thing that may help is to keep other tabs, windows and browsers closed while bidding to help keep your computer running as quickly as possible. Also it is always good to use the BidBuddy when you can, as there is a system in place that will ensure your bid is placed even if there are any unexpected network interruptions or loading delays. Please let me know if you have any other questions about this as I’ll be very happy to help you out. The reply from their customer service misleads a different interpretation than the inquiry initially requested explanation. Is there anyone who feels or felt the same? The only thing DealDash did for me, was rip me off. There were multiple times my bid was the last bid at the end of the bidding time but somehow, the time started again. I lost about $60.00 thru this shady outfit. They are stealing from people and should be shut down! The real crookery here is that they are putting their own misleading products up for bid. Fake jewelry gold plated with cubic zirconia (which actually cost about .50 cents per carat) for hundreds of dollars. The site is not only a rip-off but cause for lawsuit. I bought some bids on this site. They were at 14 cents a bid. What I really noticed is what some items went for and the repeat bidders that would bid from the start to the end. As an example: I saw this survival kit valued at over $400. Same price as listed on Amazon. The item finally sold for $ 38.94. That is 3894 bids. At a minimum of 14 cents a bid, that would actually make at least $545.16 for Dealdash. And if some bids were the 60 cent bids, even more for DD. The winner started at a 23 cent bid and was a continuing automatic, or buddy bidder, where you can put in from 1 to 1000s of bids. If you have enough bids. I was going for a bid you get 1000 bids. I watched until it got down to 2 bidders before I joined back in from earlier. (If you don’t bid before $3, you’re locked out from any bids) Again, the two competing bidders started early. I ran out of bids. It cost me $14. It was my last bids left. I’m not going there anymore. I also suspect that some “buddy bids” are robo bidders set up to drive the prices up. Especially on bids for more bids. That would be something to investigate. I think the reason the final price of an item can go way past its value is because of BidBuddy. People don’t have the patience to sit and push the “bid” button when the timer runs down, so they use BidBuddy to place bids for them. Let’s say there are a bunch of bidders using BidBuddy to place 5 bids each. That price is going to keep going up and wont stop until all the bids in BidBuddy are used, regardless of the original value. I won a gift card to the site last week or else I would never have paid any attention to it. My experience is the same as all newbies. They show you some fun, inexpensive items that, miraculously, you’re able to win with just a bid or two, and suddenly you think you’ve found the greatest deal ever. Then just as suddenly, those interesting, useful items go away and all you’re left with are their overpriced in-house brands and auctions that are *clearly* being manipulated, either by bots or in-house human bidders who aren’t really buying the product. DealDash isn’t in the business of selling merchandise, it’s in the business of selling you useless “bids” that you waste trying to buy this junk. I’m sure they let real people win occasionally so that they can have their precious testimonials. But mostly, they’re not really selling the product. For heaven’s sake, THEY’RE SELLING THE SAME AUTOGRAPHED BASEBALL REPEATEDLY! Think about that! This site blows. Bottom line. went to sigh up thru pay pal deal dash did not except my credit card security number. but after this attempt i could not pay any where with my card . found out credit card company had to block my card due to multible deal dash purchases which they denied and stoped any use on card. not all auctions to auto bid until it makes enough profit.